The cleanup of Russia’s banking sector is proving dangerous for some owners. It’s not the bank owners that have stolen billions of dollars from their own deposit vaults who get locked up, but victims of sharp operators that use the clean-up to make fast buck and let the state pick up the bill. Gleb Fetisov is one of Russia’s brightest lights. He is a senator who wanted to set up his own political party that would strive for a better standard of living. He is a respected academic who has published dozens of peer-reviewed papers on economics. And he is a billionaire businessman, a partner of oligarch Mikhail Fridman and a shareholder in Alfa Group’s telecoms powerhouse Altimo. But an attempt to sell his MyBank in 2013 went horribly wrong. The bank was supposed to be recapitalized as part of the deal, but when it immediately went bust Fetisov got the blame and spent a year and half in jail before paying out 12 billion rubles ($200 million) to cover debts to depositors and creditors to clear his name — the first time an owner has ever paid back everything owed by a failed bank. He was then released but remains under investigation and house arrest, unable to leave Moscow. However, in May this year the London Arbitration Court exonerated Fetisov, and bne IntelliNews can exclusively reveal that Russia’s Ombudsman for Business and anti-corruption Tsar, Boris Titov, has just issued an order to stop the Russian criminal investigation. Fetisov was a senator in the Federation Council, Russia’s upper house of parliament, for nine years but following the 2008 crisis he quit to concentrate on business. “Crises are good for business because they present huge opportunities,” he said at the time. Post-crisis, he decided to return to politics, and at the end of 2013 he started to rapidly sell off all his holdings to give himself a clear slate and remove any conflicts of interest. On Nov. 21, 2013, he sold his controlling stake in MyBank to a consortium of 11 investors, who gave a guarantee, as part of the agreement seen by bne IntelliNews, to recapitalize the bank and keep it going until at least 2020. However, within two months the bank’s license was revoked and on Feb. 28, 2014 Fetisov was arrested, accused of stealing 6.5 billion rubles ($111 million) worth of depositors money. He spent the next one and half years protesting his innocence before he was finally released after he took the unprecedented step of buying out all creditor claims at the start of 2015. The courts released him several months later when he promised not to go into politics after all. The dispute centers on the guarantee to recapitalize the bank given by the consortium of investors led by Vladimir Malin, a former senior Kremlin official. Instead of injecting money, the new owners of My Bank bought shares in Spyker Cars, owned by notorious banker Vladimir Antonov, “at unfavorable terms to the bank,” according to a London International Arbitration Court (LICA) ruling handed down this May. With no cash injection the bank almost immediately folded. Antonov is currently on the run from EU officials that want to extradite him from Russia to Lithuania where he faces bank fraud charges. The former owner of Portsmouth football club and Russia-based Converse Bank, he fled the United Kingdom in July 2015 after a court ruled to send him to Lithuania where he used to own Snoras Bank, before it collapsed with hole in its balance sheet of several hundred million dollars. Fetisov’s lawyers claim that Malin was actually acting in the interests of Antonov and his involvement should have immediately raised a red flag. The whole deal was designed to squeeze out what was left of My Bank by buying the car shares and then throw the husk away, leaving Russia’s Deposit Insurance Agency (DIA) to pick up the tab. The speed of My Bank’s closure suggests that had been the plan all along. The new investors were all experienced businessmen, including some high-ranking officials from the Russian government. They had the means to recapitalize the bank if they chose to. Malin, who led the group, is the former head of the Russian Federal Property Fund that controls all state property. However, instead of blaming these investors for reneging on the recapitalization deal, the authorities accused Fetisov of stripping the bank of its assets and running it into the ground. Fetisov has a distinguished business career. He got his start in 1995 as an economist for the Alfa Group, one of Russia’s biggest and most successful oligarch groups. During the noughties he rose rapidly through the hierarchy, playing an instrumental role in the takeover of a Siberian aluminum salt plant and running an aluminum smelter for the group. Ultimately Fetisov became a significant minority shareholder in Alfa’s telecom holding Altimo that owns Russian big-three mobile phone company VimpelCom, among other things. By 2015 his net worth was estimated by Forbes at $1.9 billion. In parallel, in 2000 he joined the MyBank group, which is not part of Alfa. As the peak of the 2008 crisis passed and Russia’s economy stabilized, Fetisov decided to return to politics, which is when he started selling off his assets. “Business ties are a liability in Russia,” he said at the time. He even sold his stake in Altimo: reportedly Fridman bought it back for a 30 percent discount that cost Fetisov hundreds of millions of rubles. Fetisov planned to invest more than 700 million rubles ($24 million at prevailing exchange rates) over three years to found a new opposition party, the Alliance of Greens and Social Democrats, and get candidates elected to the Duma — a move that would not have endeared him to the Kremlin. The party’s platform was for the sustainable development of Russia, the development of a quality lifestyle for all Russians, non-violence, social justice and environmental protection. My Bank was one of the first assets to go and the deal in November 2013 came at a nervous time for the market. It was closed the day after the CBR pulled the license of Master Bank, a similarly sized commercial bank with Russian President Vladimir Putin’s cousin on its board of directors. Master Bank’s closure was a shock to the market and My Bank was forced to temporarily limit withdrawals from its accounts to 20,000 rubles ($343) a day to prevent a run. The CBR was concerned and told MyBank it needed to inject some capital if it was going to remain open. When the CBR shuttered My Bank the following February, the Russian authorities got involved. The Investigative Committee (SCR) headed by Putin’s attack-dog Alexander Bastrykin detained Fetisov on Feb. 28, 2014, charging him with large scale fraud and stealing 6.5 billion rubles ($111 million) of deposits, despite the fact Fetisov left the management of the bank in August 2012, according to his lawyers, and has played no operational role since then. Moreover, the London court pointed out that the deal to buy Spyker Cars shares happened after Fetisov had sold MyBank and he did not financially benefit from the transaction. Antonov was also found to have forced his Lithuanian bank Snoras to buy Spyker Cars shares, which was one of the ways that he extracted money from his banks. Russian investigators have not interviewed Antonov as part of the case despite his obvious central role. The SCR went on to accuse Fetisov of stripping out MyBank’s good assets, collecting them in Altimo, a Fridman company that Fetisov did not control, and then selling them to himself. Malin and his fellow shareholders claim that they lost 2 billion rubles ($34 million) as a result of these deals. 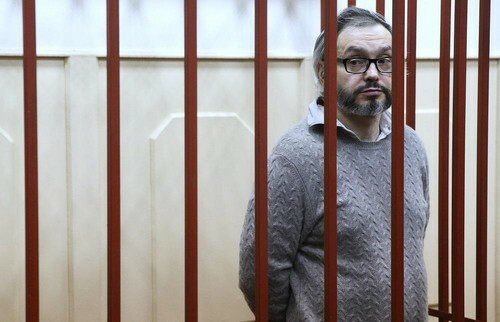 Fetisov was held in prison until August 2015 when a Moscow City Court released him after in January the same year he paid the bank’s debts “to clear my reputation”. But he has remained under investigation and house arrest in Moscow ever since. In May this year, the dispute was finally taken to the LCIA in London, where it should have been heard according to the agreement. The LCIA ruled that Malin and his co-investors had caused the collapse of the bank and that Fetisov played no role in the deal to buy the Spyker Cars shares. The LCIA ruled that “the defendant Malin violated clause 5.4 of the agreement [that covered the promise not to close the bank until 2020] ” and awarded Fetisov compensation of 1.75 billion rubles ($29.9 million), including losses suffered by Fetisov of 677.4 million rubles ($11.7 million) and 712 million rubles ($12.2 million), as well as interest, legal and arbitration expenses. “Fetisov did not take any actions that would lead to the insolvency of MyBank or to revoke its license, and, therefore, did not contribute to the collapse of the bank and did not affect it,” the LCIA said in its summing up statement seen by bne IntelliNews. Now in the last instalment of the story, Titov has got into the game and, as bne IntelliNews can exclusively reveal, in November he issued an order to the SCR to halt the Russian investigations into Fetisov. After Fetisov paid off MyBank’s creditors the bank was wound up. There is now no bank, and no victims, and yet the Russian investigators kept the case open. As part of the state’s battle with corruption, Titov was given special powers by Putin to stop any criminal investigation if he has solid grounds to believe the charges against a businessperson are unwarranted or being used as a pretext for extortion by state officials.